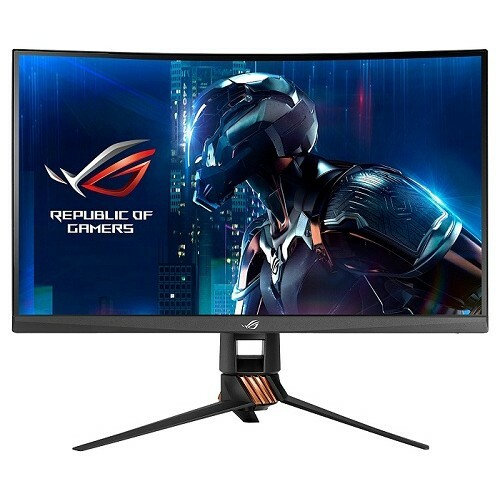 Asus ROG Swift PG27VQ Curved 2K WQHD (2560x1440) 27-inch Gaming Monitor has extraordinary overclock-able 165Hz refresh rate & 1ms response time to compliment high level gaming situations. The NVIDIA G-SYNC Technology ensures fast response and crystal-clear images. ASUS Aura Sync lighting technology creates surrounding lighting and synchronized environment for Aura-based components and peripherals. This supreme gaming device featured with ergonomically designed stand for spontaneous movement and height adjustment. Having this exclusive gaming monitor in your setup would be a pride and to make this happen we offer the best price in Rangpur, Dhaka, Chittagong & Sylhet. You can order this brand new gaming giant through our official site and our online delivery channel will deliver this at your desired location.